Hi Vikash, Quazi public vehicles' network. Interesting! I too think autos are a great business and make great sense as a transit option, but they are poorly organized to realize their true potential. WRT to your idea i have a few questions... #1. without right of way, if metro has to compete with peds and traffic, it is just an expensive tram, which no city with bangalore's profile uses. how can at grade metro work? #2. for some reason, city planning is strangely poor/absent in BLR. Take whitefield for example, the internal road network is extremely poor. Village roads have been asphalted and converted to urban roads. they have allowed really dense development by permitting all sorts of commercial, industrial and residential complexes to come up, yet the roads are narrow and ped facilities non existent. Transit infrastructure is not sufficient to handle even this internal movement, forget added congestion due to people coming in from other parts of the city. similar inconsistencies are found in other areas. without addressing this, how does adding more quasi public vehicles to the already high number of private vehicles help? lack of planning and sprawl means transit is not only crucial but also a pressure point. one way or the other, the city will have to spend lots of money now to address this problem. First, I completely agree with the fuel subsidies point. The cost of using private transit is artificially low. And the cost of public transit is artificially high because of this. But it is difficult to ban this. Lots of small-scale commercial businesses meet their bottomlines only because of this. Second, I am sold on the idea of organized quasi public transit. You are preaching to the choir there. Have you considered bearing in IT on existing auto system, perhaps as a first step? Easy Auto is trying it, but it is too small a setup to carry it off to its fullest potential that you describe. That’s zonal connectivity. However, for interzonal connectivity, I am not convinced that the role of large capacity, right-of-way systems can be dismissed or let out to low capacity systems like buses and monos to carry. Primarily because as it is laid out BLR is a city with a lot of sprawl. I am not hostile to BG rail systems, after all it is also a rail based system only wider. We have explored that in quite some detail here at praja and at silkboard’s website. 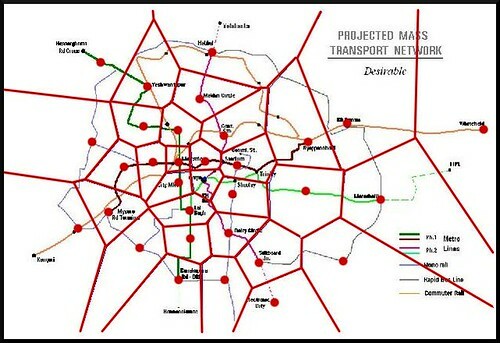 There is a solid chunk of network especially in the northern half of BLR that could act as force multiplier to metro. But it comes with its own set of limitations. Anyway you cut it, Majestic area comes out as a critical point in BLR transit, yet SBC is already thought of as being saturated, for example. While it carries zillions and is the city’s lifeline, Mumbai’s commuter rail system is controlled by WR & CR, I am not sure if they have been as responsive as they should have been to Mumbai’s needs. From their experience, it is not clear if that system is scalable. How much they have expanded over the years, how much they have innovated, how many new services they have added, is not clear. Mumbai itself has gone the metro route for expansion. BG system automatically brings in IR and the entire bureaucracy baggage of Rail Bhavan, Dilli. The principal costs are not technological but land costs, primarily because neither old areas nor the new ones are marked for public utilities. Land acquisition also increases with at grade rail systems, you need all the space for two tracks, median and shoulder buffers. Plus, all the problems of squatters, intrusions, accidents etc… it will be great if you can lay out a map or a graphic of how your network would look, it will help. Please don't mind my queries, since I cannot attend your symposium, I am trying to understand your system through queries. Anything on road will suffer from congestion - No doubt about it. BRTS on Poona has become an utter flop with private vehicles entering the BRTS track since the road became congested. These are the technologies pushed by Bus manufacturers like Volvo. Also, this will further increase the traffic jams. These buses needs to be treated like VIP cars. We have seen the ramifications of a VIP passing. Its all good in the paper and website posted to read. But, in a congested city and country like ours, Metro train / Monorail is the only solution. These confusions will further delay the metro work and divert people's thinking in different direction. Vasanth, While Vikash is the best person to defend his turf, i think it is more than BRTS. I donot see it supplanting metro but it can completely energize it. I see it as an organized quazi public transit system. Which is very important for a country of high population like ours. billion people with billion cars is going to take heavy toll on us. It is truly next gen in that this sits on certain basic infrastructure. Intelligent system, given a network, but for us right now the critical question is how to make the network itself smart. nxn lane roads with unplanned intersections are not smart. given that how much can you solve by intelligent distribution and control? One thing is clear Ford and Tata are not going to like Vikash's idea ;). Perhaps Bajaj & even TVS, would court him but the big guys are going to wince and twist. But Vikash's efforts are really commendable, in that not many academicians and not many funding agencies are interested in solving real day-to-day problems. They are all interested in abstract and hi-fi way too futuristic stuff. But he is trying. Ford 2000: If you live in a city, you don't need to own a car. do tell us about why you think it is disoriented and has its priorities misplaced. cost is unavoidable, any way you cut it we are going to pay. what ever we pay for public transit, we will end up paying on vehicles, maintenance, petrol, safety, time etc in lieu of it. one way or the other we are going to pay. the question is to what do we pay for and why? do we gain more in quality of life if we buy in to one option? This is not clear --- First of all, the cost of 16,000 crores for 33km is incorrect - it's 6395 crores for 33km, which may scale up to around 9,000 crores for 41km with the extensions on N-S line & with cost escalations. Second of all, 'Metrolite' is almost exactly what is being planned by the authorities, with feeder bus services from all Metro stations. The real point is to reduce the no. of vehicles on roads, which the Metrolite system does not seem to address. Third, & last of all, Metro "at grade" ?? Authorities are struggling to find land to fit in Metro alignments & most of the tracks are to run either elevated or underground due to scarcity of land & high cost of acquisition - so where can the land come from in dense corridors to run it on grade ?? What is wrong with Bangalore Metro design ? I agree with tarlesubba. Congestion is the most difficult part. Flyovers and subways are not the solutions because even they get clogged. Anyone has a solution for congestion? Vikash has travelled extensively on Delhi Metro and writing his experience. We all are under the illusion that once Metro is here, all the problems are solved and writing that. As mentioned by Vikash, stations should be atleast 2kms apart. There should be good feeder service. Buses will be as usual crowded, energy efficient cars and vans should be ideal giving door to door service. Tata's 8 seater auto (modified ace) and Omni 8 seater are all good candidates for this. This kind of shared autos, basically normal autos are running in many parts of the city and serving the purpose cheaply. One example is Kodigehalli and Sahakar Nagar. Here, internally people have to walk lot of distance after getting down from the city Bus. Taking a normal auto costs minimum of 12 rupees. Ranging from 3 rupees to 5 rupees, shared auto will drop wherever we want within Kodigehalli. Similarly in Mysore, around Udayagiri, lot of shared autos run to Mysore Suburban bus stand. These are very cheap means of transport and acts as a very good transport solution - Tuned properly will make very good feeder service. BMTC should also workout by running smaller buses like Swaraj Mazda / Tempo Traveller touring around almost all the part of the nearby locality surroundingg the Metro/Mono Station. Here BMTC's role is very important. It is the feeder service which can make Metro Successful / Unsuccessful. Right Vasanth. And a good feeder service has to work both ways. One is to help you get to a Bus hub or a Metro station. the other is to have a minibus/auto/van etc ready asa soon as you alight from a bus or Train at local Metro/bus station. This calls for coordination in schedules, information systems that tell you about schedules and expected wait times. Not that Metro (BMRC) and BMTC aren't thinking about these, they have smart guys who know these things. But I wouldn't bank on these govt bodies to do a good job of coordinating and planning these. Government bodies have this tendency of blaming other govt bodies when things don't work smooth (BMTC will blame traffic police and roads for not keeping schedules). The first step - we need a BMRTA like thing, and need it *NOW*, a regulatory and monitoring body sitting on top of all local transport bodies. The second step - transparency in the way large projects get planned and funded. BRTS, Metro or Mono or space shuttles - we don't care. Just tell us why are thinking what you are thinking thats all. i was wondering what vikash was talking about so did some plotting. voronoi map on the metro map. Around each station(dot) is a "cell" and similarly each cell has one dot inside it. Each cell marks all points that are closet to its dot. if people use the closet station to where ever they are then each cell represents the geographic catchment of a station. obviously you have to consider roads, but let us go with this simple model for now. next obviously only people living in a certain radius around the station will use that station, so i drew one circle around each station. so let us see how that looks. i cannot scale the circles accurately, but have chosen a size so that the catchment area is appears visually reasonable. (too lazy to plot stations on GE etc...) the radius map shows that the stations have a lot of redundancy and even overlap simple geographic catchment model. i would have assumed that each station would only overlap with the catchment of its immediate neighbour stations. but some stations even have multiple redundancies. what are the implications of this? If you assume that each station is equal in terms of amount of parking and standing space it offers, then you have to take population density into account as well when drawing a radius around each of them. Have they (Metro planners) done a bit of that? More stations close-by in areas with more population? Back to your point, the implication of overlapping "catchment areas" would be cost. May be we can do with fewer and larger (in terms of space for parking or feeder services) stations, save on some sabse-bada-rupaiya. I have travelled extensively in Europe, US and South Korea (Which has one of the best public transport in the world). This is how a metro is planned. What we are seeing is just 1st Phase of Metro only 2 lines. If bangalore gets couple of more lines (Hopefully by 2020), then you will see that, you can go from anywhere to anywhere in bangalore without walking much. Normally every city has close to 5 to 6 lines. Bangalore has just 2 lines to start with. So guys there is a long way to go 2020 and beyond, so hold you breath and analysis until then. Cheers!!!!! SB... you are right , i too thought of density, but density map of BLR is fairly contiguous. check CDP Vol 1 page 31. ditto traffic density map, there are natural big streams. bangalorean... :) right right, habitual defects. just seeing how it will pan out. i posted a test iternary somewhere. Yeshwantpura->MG Road, Comm Street, to Magrath - Yeshwantpura. oh i remembered narrow lanes thread. unanswered questions...density, radius, redundancy etc. 1) a train station should be in walkable distance for me to use only the train. 2) a bus station should be in walkable distance for me to use only the bus 3) an auto stand should be in walkable distance for me to use the auto. and any mode should be affordable and comfortable. What we need is 1) Round the clock (4 AM - 12:00 AM) transport system with high frequency 2) an effective network of rails (metro/mono/whatever) 3) an effective network of buses/trams which takes me to the nearest train station a) radial network of rails b) circular network of rails which connect points on the radial network ( at say ORR) c) a circular network of rails in the CBD (ex : the loop in chicago) d) a network of buses which run for short distances connecting the areas in between to the train stations. ( every bus need not end at majestic) e) abundant parking facilities at city boundaries. ( so that people leave their cars and come to the city in the trains) f) a network of rails to the next villages so that they become mini bangalores ( i forgot the term which tarle uses for these :). please fill it up for me, tarle) g) all transport from outside the city should end at city periphery. ---( see the private volvo buses which run from majestic to tamilnadu/kerala, they are mostly empty from majestic till madiwala. So why should they go into the city at all. ) --- There should be major bus terminuses at all four ( six/eight ?) corners of the city. All long distance buses should end there. People should have reliable city transport which will take you to these terminus. --- Same thing applies for railway stations as well. Develop KR puram, yashwant pur stations, yelahanka, ( may be more stations are there ..) and end major out of city trains there. -- The key is decentralization. Essentially i should be tempted to take my car out only to go to nandi hills and not inside bangalore. Another interesting aspect is that the parking costs are too high in ( within CBD) many of the cities world wide that people take mass transport just to avoid parking cost. if there is a volvo bus at a frequency of 15 minutes from say bannerghata road to commercial street and vice versa, i will never take my car to go to commercial street from bannerghata road. Another dire necessity is parking space where i can leave my personal vehicle and hop on to a public transport system. For example : people coming from ITPL side to CBD. There are two main roads which lead out of ITPL. if there is a huge parking facility available at say marathahalli junction/KR puram junction and buses/trains which arrive/depart at this spot at a frequency of 15 minutes, i am sure most would leave their cars and hop on to the public transport system. What we need is such kind of infrastructure. Vikas, What you seem to be saying is that you have some idea, which will have multiple modes of transport. People will be able to hop from one to another and move quickly around. And the mode of transport is decided on what is the most economical/environment friendly/convenient method to go from X to Y. You have sound economic/factual reasons which support your idea. If this is a business idea (patentable/having commercial value) , then I feel this is not the right forum. if this is a city improvement idea which people of Praja can take up, please share details in this space. Lot of people may read it and some may usurp it but this is an idea which you want to share right ? If you think of it, a car parked for 8 hours (at our offices, or say at a bus stop or train station) is a colossal waste of two resources. One, the car itself, second, the parking space it takes. Thampan - very good points about Rapid Transit system. Thats the sort of thing Bangalore needs. And Bangalore city planners seem to think we will get there via Metro and the upcoming TTMC/Volvo plans of BMTC. 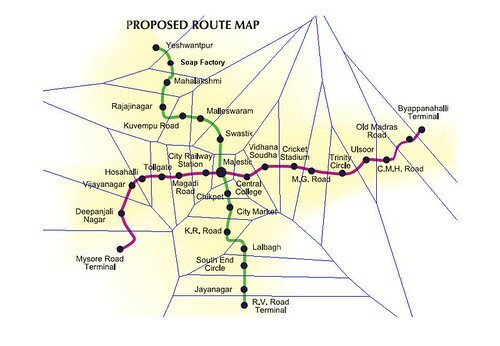 I think blr's pubtrans network needs an artery system of the type naveen and thampan are proposing- ROW network (ROWN). The basic problem is sprawl and blr's road arteries are not and cannot ever be strong enough to carry the burden of road based system. they have to be supplemented by that of ROWN. for example consider the problem of airport connectivity. no form of road based system can give meaningful connectivity to it. only a ROWN that has a depth and reach within various blr regions can meaningfully address BIAL connectivity problem. network and airport is just a preview, in the next few years NoBa will explode. BIAL is not the only place which has the "how-to-get-there"(HTGT) problem. EC, ITPL, Peenya, SBC etc all have their own HTGT problem. I took Naveen's network and roughly plotted some critical nodes - it needs work, but even then a meaningfull cell map is beginning to emerge. This is in contrast to the skewed cells that the two lines produce. (see above) The cell is ofcourse where the action is. and drawing these maps, i am beginning to appreciate the logic behind 2kms apart stations. the cells have to large enough to make them meaningful, yet small enough to develop their own arteries that will create more traffic. notice how cell boundaries are mostly intersecting n's network lines rather than running parallel to them. metro lines will attract growth and growth needs to attract metro lines. how do you solve HTGT on BNG rd - KNK Rd? SB great aha comment. never thought about it like that. can make a great use pubtrans ad theme. I have tried to capture what i think bangalore should attempt at. The alignments are not exact . I just drew lines on the map, these may not be really practical. I have depicted the current bangalore boundary ? with a green line. Please find the link to the google map below. http://maps.google.com/ma... ideally i should have at rail station within a km from my current point. In the above map, it is only possible in the central area. as the cost of rails is high, may be we should have buses supplementing the rails as we move farther from the center. RFID revolution? The ministry of heavy industries is considering a proposal to make it mandatory to fit RFID enabled devices in the cars manufactured in India. It will be the responsibility of the car manufacturers to ensure that all new cars have these radio-frequency identification tags. It is believed that RFID tags would help in traffic management as traffic violations by motorists could be tracked and all violations identified. Also, motorists would get charged automatically as soon as they enter a toll area. SkyBus -- Should not we attempt to test it. I do agree that Metro rail, we are expecting too much, one imminent short fall of METRO is the last mile connectivity. As a feeder to METRO should not we also think about SKYBUS, a pioneering technology from Konkan Railways. I have read about all the facts prepared by KRL,my INDIAN pride grows, also SKYBUS is a strong case for technological, commercial feasibility, and of course it is sustainable as well. I still wonder why people are not interested in SKY BUS technology, at least I could see no demerits in the system. I strong suggest, we need to test SKYBUS as a feeder to METRO where ever its possible. Please note among all the MRTS SKYBUS can be constructed faster. 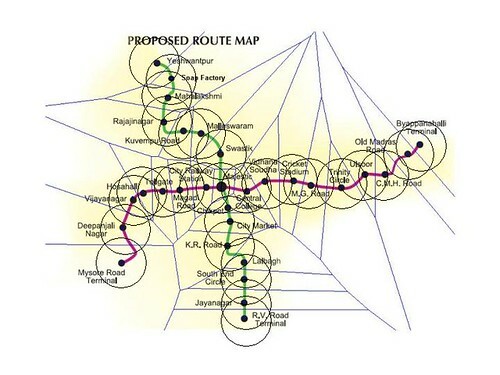 What's so awfully wrong with Bangalore Metro design ? What the "public" doesn't get about "transport" ? Do blogs also need to be marketed ? Indian IT professionals among worst paid globally - What does it mean for Bangalore ?